Major spare parts of the colloid mill are made of high quality stainless steel and free from corrosion and poison. The major working parts, rotator and stator, are made by advanced technology and excellent processing. The adjusting ring, with the measuring scales on it, it ‘s easy to read, use and can make micro-adjustments between the spaces so as to ensure the quality of products. According to different raw material, rotators and stators made of various ingredients are available in our company. They are all easy to disassemble and clean. 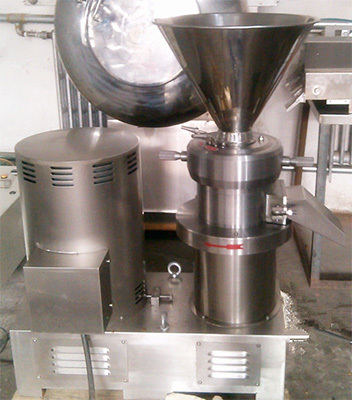 Colloid Mill features excellent breaking,emulsifying, homogenous and uniform mixing capability. For most solid materials, their grinding particles can reach diameters of three micrometers and homogenous rates of above 90%, which make the colloid mill an ideal processing facility for ultrafine particles. The machine can perform similar machinery tasks of homogenous machine, ball mill, three-roller polishing machine, agitator and plasm-grinding machine. homogenous rate more than 90%.